Our filly which was finally named "Tsunami Surreal", was supposed to go through the sale but was scratched and we since have decided to try her ourselves as a project. She was broke in the fall, but is just hanging out on the farm right now gowing up until we return from the Fairgrounds in April. She is growing up and filling out so nicely I just wanted to share her picture. She's a big girl so we are not in any rush to get her started. We're very excited to have our own homebred in training this year!! Best of luck with her! There's nothing more fun than racing a homebred. 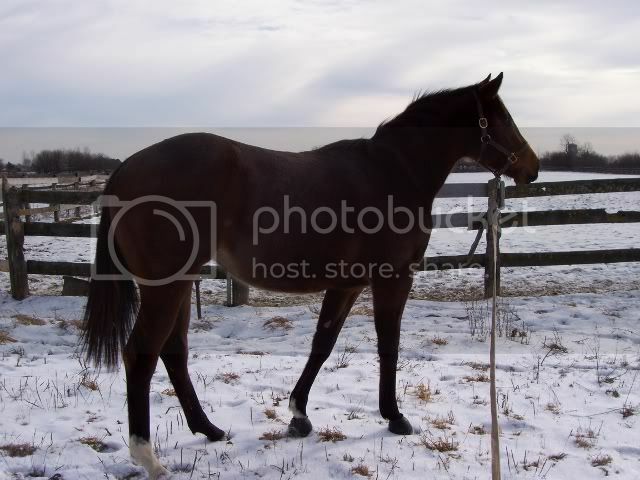 I love horses in the snow ,you could have named her SNOVA after her sire and your name. She looks pretty solid and will be fun to follow this summer, lots of luck with her. "People come and go but horses leave hoofprints on your heart"
Weather Warning is now standing in New Mexico and on our radar for a future breeding season. I'll keep an eye on your girl. Great name. Loved Weather Warning up in Ontario ,they never should have let him go. I had a couple in training that I liked but they were raised indoors and could not stand training. Give them a hardy New Mexico outdoors childhood and you will not be disappointed.